the following is a two-part interview of Bill by Jasumeen after the retreat. ed: below are extracts from Andrew Durham’s book “Hygienic DarkRoom Retreat”. Andrew Durham’s website. Hygiene is passive toward healing. In other words, the will is mostly passive. The unconscious is active and drives the process. The will is secondary, a servant. Its main purpose is to rest so the being can restore itself to wholeness. Hygiene is thus a peacemaker, allowing the distressed will to finally rest and recover. Hygiene primarily depends on the autonomic self—omniscient, omnipotent, and infallible—to accomplish the work of healing. This hints at limitless results. There is nothing mystical, disciplined, or complicated about this approach. It is rational, safe, and natural: a reliable miracle. Hygiene’s passive emphasis on rest and healing is very important because it defines the appropriate attitude toward retreating. I learned in fasting that how one approaches a retreat has a great effect on what happens in it. These three approaches all share the vain attempt to end suffering by subjecting the unconscious to conscious action, as if mere attention, analysis, or reconditioning could fix the unconscious. They try to willfully improve what they regard as an inert, even resistant unconscious self, as if it were incapable or disinclined of doing so itself. Unfortunately, this attitude is ignorantly coercive toward the injured conscious self and discouraging to the omnipotent autonomic self. It is internalized tyranny predictably accompanied by triune brain-drain. In contrast, hygienic use of darkness is passive as regards the will. The conscious self only plays a supportive role. The unconscious autonomic self is the principal actor. Zero conflict. Maximum efficiency. Perfect result. 1. It is not discipline, such as meditation. Discipline is consistent exercise of the will. Will is the most delicate, energy-consuming, and, due to atrophy, ineffective part of the psyche. The psyche is the system most in need of rest. So discipline sets into motion and takes energy from the healing of the faculties it depends on while giving the least possible benefit for time, energy, and effort expended. Granted, it produces results impressive by the tragically low standard of ordinary people. But it prevents accomplishment of the top priority: full recovery of the psyche from its catastrophic damage. Spiritual meditation, like all spiritual practice, entails supereffort to force access to subtle energy reserves to fuel transformation. The hygienic approach entails exactly the opposite: profound rest to conserve movement and energy for self-restoration. The conscious self at- tempts nothing to ameliorate suffering. It only provides conditions of healing to the unconscious, autonomic self, whose job is to heal the organism. Discipline begins with accepting as real, as natural, the appearance of an intrinsic internal conflict: original sin. Next, one struggles “against nature”, fighting habits with practices to achieve an ideal. Hygiene begins with an assumption of natural harmony, of non-contra- diction and a logical explanation of illness. This naturally motivates one to easily fulfill its aim, which is healthy in reality. Lastly, discipline sets up artificial dangers and obstacles by partially retaining willed control of the process. Then it spreads fear about retreat- ing without the necessary preparations guided by experts of the tradition. It’s a self-fulfilling delusion if not an outright racket. 2. It is not therapy. Therapy is done to a passive organism from the outside. The therapist, therapy, and therapeutic substances are the principal actors in a therapeutic session, not the organism itself. While depending on the organism to react to treatment, therapy views the organism as incapable of initiating a movement toward health. It fails to see such movement in disease itself. 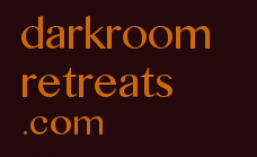 In a darkroom retreat, darkness does nothing. Like air or water, it merely presents an opportunity to the self-preserving organism to better pursue its ceaseless tendency toward wholeness. The principal actor is life, not its conditions nor any treatment. 3. It is not a psychedelic trip: consciously experiencing normally unconscious phenomena using abnormal conditions like sleep-deprivation or chemicals, natural or artificial.